Nigeria is the largest producer of plantain in West Africa, with an annual production of about 2.4 million metric tons, according to a recent report from the Forum For Agricultural Research in Africa ( FARA). Analysis. Nigeria is the largest producer of plantain in West Africa, with an annual production of about 2.4 million metric tons, according to a recent report from the Forum For Agricultural Research in Africa ( FARA), the technical arm of the African Union Commission (AUC) on matters concerning agricultural science, technology and innovation. Plantain consumption helps to address food security and plantain flour is also seen as healthy with nutritious values, according to the study. Plantain has diverse use in medicine, industries and households. These uses has made it demand upsurge in the last decade and positioned the food crop as a viable product for export. One of the major derivative of plantain is plantain flour which is used in the production of baking pastries, waffles, pancakes, breads, soups & more. There are numerous opportunities to be harness by investors along the crop value chain. The plantain industry should be developed with favorable policies and strong support from the Nigeria government to ease difficulty of business, and integrating strategic investment in plantain, specified the researchers. There are three major constraints with plantain production. 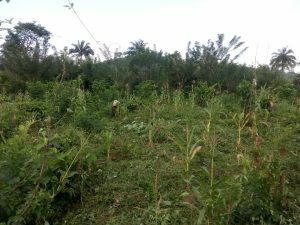 Farmers have to deal with the changing climate( off-season, on- season), the menace of pest and disease linked to climate change and the access to finance to determine the price of their plantains. Adeolu Babatunde Ayanwale, Fatunbi Oluwole Abiodun and Ojo Mathew Pau, three researchers from FARA analyzed the various activities of the key actors in the plantain value chain across the southwest region, one of the major centers of plantain production in Nigeria. The study shows that about 49% of farming households are producing plantain as their main crop. 82% of the farmers belong to farmers association, while about 64% also belong to cooperative societies. 90% of the farmers needs 180,000 Naira ( 432 euros) to fill the financing gap. However, membership of cooperative society can have access easily to credit, noted the researchers. The analysis collected data from 300 producers from six states: Lagos, Oyo, Ogun, Osun, Ekiti and Ondo. The study has selecting 15 marketers, processors and consumers per state to give a total of 45 respondents for marketers, processors and consumers respectively. According to the researchers, plantain production is mainly dominated by males, monogamously married with an average age of 49 years old and a primary school education. Plantain production is becoming a significant economic activity for income for both large scale and small-holder farmers. It is one of the primary commodities for investment across the southwest of Nigeria, occupying a strategic position for rapid food production. The industrial processing of plantain has recently been adopted. This sector is largely dominated by women (93%), below of 50 years old with 74% having at least primary school education. Women, according to the study, help to solve the challenge of quick ripening and spoilage of plantain by processing into plantain flour and unripe fried plantain chips. The researchers analyzed also the role of women in the plantain marketing. 96% of the farmers working in the plantain marketing are women. 60% of these marketers are below the age of 40 years old and 72% are married. Plantain flour marketers have the highest mean annual net income with a salary of 97,000 Naira (233 euros) closely followed by fresh plantain marketers with 84,015.96 Naira ( 201, 33). Fara’s researchers explained that there are more city consumers of plantain consumption than village consumers. 63% of farmers used motorcycle as a mode of transportation for transporting plantain from their farms to the major points of sales before vehicles are used by purchasing marketers. The study demonstrated that village consumers get their raw plantain directly from the farmers followed closely by local market while city consumers get raw plantain mostly from the markets in their neighborhood and others purchase directly from plantain retailers. The marketers of plantain chips earn annually 72,700 Naira (174 euros). However, 46% of plantain flour marketers lack of finance and complain of not having enough funds to do the business as they would have loved. The Fara study emphasized also that improve income is needed and modern processing equipment is required to encourage further production and ensure employment in the southwest region.